HOMESTEAD, Fla. — Denny Hamlin found redemption for a lost season, as Jimmie Johnson advanced to the threshold of legend. Sidelined for four races with a broken back earlier in the season, Hamlin took the checkered flag in Sunday’s Ford EcoBoost 400 at Homestead-Miami Speedway, as Johnson claimed his sixth NASCAR Sprint Cup Series championship with a ninth-place finish. Johnson finished the season 19 points ahead of polesitter and race runner-up Matt Kenseth, who held off a furious charge by third-place Dale Earnhardt Jr. in the closing laps. With six NASCAR Sprint Cup titles, Johnson is one behind all-time leaders Richard Petty and Dale Earnhardt. The title was a record 11th for team owner Rick Hendrick. “I don’t even know where to start,” Johnson said after the race. “I’m at a loss for words, but I’m so proud and so thankful for this opportunity at Hendrick Motorsports. I’m thankful that Jeff Gordon and Rick Hendrick gave me this opportunity back in 2002. Hamlin won for the first time this season, the second time at Homestead and the 23rd time in his career. The driver of the No. 11 Joe Gibbs Racing Toyota has won at least one race in each of his eight full seasons in the NASCAR Sprint Cup Series. As elated as he was with the victory, Hamlin took time to acknowledge the excellence of Johnson and his No. 48 team. Johnson’s average finish in the 10 Chase races was 5.1. “I think they do a great job of being consistent,” Hamlin said. “Really, I’d say with everyone else in the Chase, you can almost count on them having one bad race. The 48, they just never have that one bad race. I don’t know how to explain it, but they just don’t make any mistakes. You have to beat him on performance. To do that, that’s really hard. Martin Truex Jr. completed his tenure at Michael Waltrip Racing with a fourth-place run, one spot ahead of teammate Clint Bowyer. Brad Keselowski, Kyle Busch, Joey Logano, Johnson and Kevin Harvick rounded out the top 10. Johnson’s path to the title was far from easy. Moments after a restart on Lap 194, Paul Menard rammed the back of Johnson’s No. 48 Chevrolet as the outside line checked up. The impact jerked Johnson’s car sideways, but the five-time champion was able to regain control and keep the car off the outside wall. His momentum sapped, however, Johnson plummeted to 23rd in the running order, the precise finishing position he needed to secure his sixth championship. Over the next nine laps, Johnson recovered to 16th and drove the No. 48 out of the danger zone. From that point on, he advanced as high as sixth before finishing ninth, and the sixth NASCAR Sprint Cup title was his. “I had contact from behind that pushed me into the 20 (Kenseth), and both of us were out of control and sliding toward the outside fence at that point,” Johnson said. “I didn’t know what to think. That got us mired back in traffic and made the last 50 laps kind of interesting. 1. (5) Denny Hamlin, Toyota, 267, $322350. 2. (1) Matt Kenseth, Toyota, 267, $293251. 3. (21) Dale Earnhardt Jr., Chevrolet, 267, $203860. 4. (8) Martin Truex Jr., Toyota, 267, $174235. 5. (25) Clint Bowyer, Toyota, 267, $167968. 6. (4) Brad Keselowski, Ford, 267, $156701. 7. (11) Kyle Busch, Toyota, 267, $140293. 8. (3) Joey Logano, Ford, 267, $119518. 9. 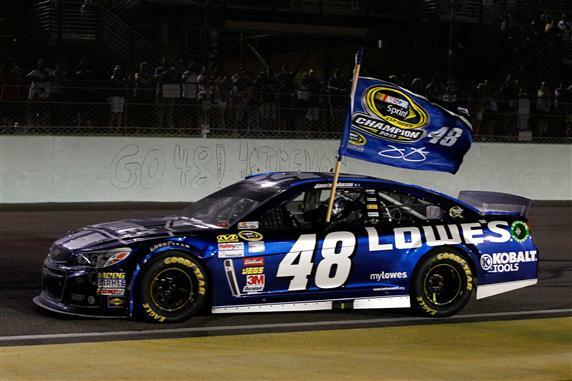 (7) Jimmie Johnson, Chevrolet, 267, $134221. 10. (6) Kevin Harvick, Chevrolet, 267, $126246. 11. (26) Jeff Gordon, Chevrolet, 267, $123596. 12. (18) Carl Edwards, Ford, 267, $115435. 13. (13) Kasey Kahne, Chevrolet, 267, $94060. 14. (10) Elliott Sadler(i), Toyota, 267, $88110. 15. (20) Kyle Larson(i), Chevrolet, 267, $107593. 16. (19) Aric Almirola, Ford, 267, $116421. 17. (15) Ryan Newman, Chevrolet, 267, $113343. 18. (27) Juan Pablo Montoya, Chevrolet, 267, $105999. 19. (22) Mark Martin, Chevrolet, 267, $121585. 20. (24) Danica Patrick #, Chevrolet, 267, $80935. 21. (2) Kurt Busch, Chevrolet, 267, $104255. 22. (9) Ricky Stenhouse Jr. #, Ford, 267, $122396. 23. (14) Jeff Burton, Chevrolet, 267, $85360. 24. (16) Greg Biffle, Ford, 267, $91660. 25. (30) Parker Kligerman(i), Toyota, 267, $93543. 26. (23) Marcos Ambrose, Ford, 267, $103724. 27. (31) David Gilliland, Ford, 266, $90368. 28. (40) Casey Mears, Ford, 266, $95568. 29. (29) David Ragan, Ford, 266, $93157. 30. (28) Jamie McMurray, Chevrolet, 265, $103230. 31. (32) David Reutimann, Toyota, 265, $74685. 32. (37) JJ Yeley, Chevrolet, 264, $71960. 33. (39) Landon Cassill(i), Chevrolet, 264, $71760. 34. (41) Ken Schrader, Ford, 263, $71560. 35. (42) Joe Nemechek(i), Toyota, 263, $71360. 36. (36) AJ Allmendinger, Toyota, 257, $79135. 37. (33) Travis Kvapil, Toyota, 248, $78912. 38. (38) Dave Blaney, Chevrolet, 242, $65750. 39. (12) Paul Menard, Chevrolet, Accident, 229, $91741. 40. (17) Trevor Bayne(i), Ford, Engine, 223, $57750. 41. (35) Josh Wise(i), Ford, Rear Gear, 119, $53750. 42. (43) Tony Raines(i), Chevrolet, Vibration, 104, $49750. 43. (34) Michael McDowell, Ford, Brakes, 63, $46250. Time of Race: 3 Hrs, 03 Mins, 52 Secs. Margin of Victory: 0.799 Seconds. Lap Leaders: M. Kenseth 1-11; D. Hamlin 12-13; M. Kenseth 14; K. Harvick 15; M. Kenseth 16-25; D. Ragan 26; K. Harvick 27; Kurt Busch 28-31; M. Kenseth 32-91; K. Larson(i) 92; M. Kenseth 93-139; D. Earnhardt Jr. 140; M. Kenseth 141-142; D. Earnhardt Jr. 143-153; M. Kenseth 154-166; D. Hamlin 167-207; K. Harvick 208-213; B. Keselowski 214-222; D. Hamlin 223; D. Earnhardt Jr. 224-235; D. Hamlin 236-239; D. Earnhardt Jr. 240-243; D. Hamlin 244-267. Leaders Summary (Driver, Times Lead, Laps Led): M. Kenseth 7 times for 144 laps; D. Hamlin 5 times for 72 laps; D. Earnhardt Jr. 4 times for 28 laps; B. Keselowski 1 time for 9 laps; K. Harvick 3 times for 8 laps; Kurt Busch 1 time for 4 laps; D. Ragan 1 time for 1 lap; K. Larson(i) 1 time for 1 lap. Top 13 in Points: J. Johnson – 2,419; M. Kenseth – 2,400; K. Harvick – 2,385; Kyle Busch – 2,364; D. Earnhardt Jr. – 2,363; J. Gordon – 2,337; C. Bowyer – 2,336; J. Logano – 2,323; G. Biffle – 2,321; Kurt Busch – 2,309; R. Newman – 2,286; K. Kahne – 2,283; C. Edwards – 2,282.